NEW ORLEANS – Registration is now open for the 2018 USTFCCCA Convention! 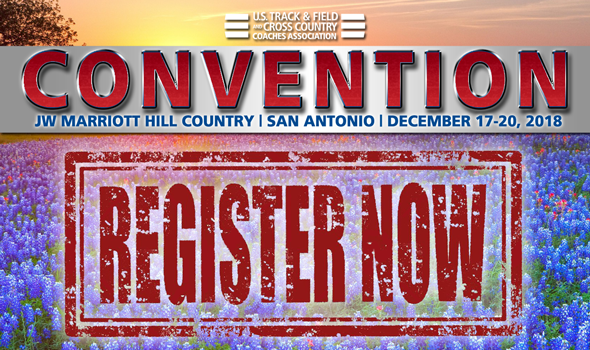 This year the annual USTFCCCA Convention runs from Monday, December 17 through Thursday, December 20 at the JW Marriott San Antonio Hill Country Resort & Spa. Make sure you’re part of the 2018 USTFCCCA Convention by registering now. You can do so through the Convention website, which has an updated look. Early registration for Convention runs until November 30. Current USTFCCCA members pay $375 and spouses of current members would pay $350. Registration fees increase to $450 and $425, respectively, if handled after 11:59 pm ET on November 30, which falls on a Friday. Payment is accepted via card (VISA, Mastercard, American Express and Discover) as well as by check and money order. If you pay by check, make sure it is postmarked to the USTFCCCA office by November 30, because otherwise you’ll need to bring your payment to San Antonio. For more information about registration and Convention, be sure to check out the Convention website.